Cook all the ingredients together in a pot until the zucchini is just tender and bright green. At this point, chill the mixture in a bowl over an ice bath, stirring frequently to aid in the cooling process. When the mixture is ice cold, puree the ingredients in a blender until the mixture becomes a uniform emerald green. Strain the mixture into another bowl over an ice bath for the pureeing will have begun to warm the base again. When the mixture is cold, set aside in the refrigerator for about a half an hour or longer. Preheat a non-convection oven to 200 degrees F. Meanwhile use a template to spread the ribbon base on a silpat on a sheet pan. Bake the ribbons in the oven for about thirty minutes. The ribbon should be completely dry and come off the silpat cleanly with only a little help from an offset spatula. Shape the ribbons immediately and let cool. Store in a dry environment or use immediately. When was the last time you sat down and ate an ice cream sandwich or a derivative there of? For me it has been ages. Yet, I still remember that soft cookie exterior with the firm smooth ice cream beneath. The cookie was nothing special, the ice cream was adequate at best, though the experience was truly great. Last evening we began working with, what I think I will not be able to leave alone, small ice cream sandwiches. Of course being me I began with olives. We made a black olive crisp which we used to sandwich our olive chip ice cream. We served the sandwich with ground and sandy olives, olive brine caramel and young epazote. Imagine the possibilities with flavors and textures that we can work with. And what if we went more savory or just served the ice cream sandwich at the bar along with a martini or used hot ice cream in the winter? My brain is now working again, it stalled midday yesterday and is only now restarting. 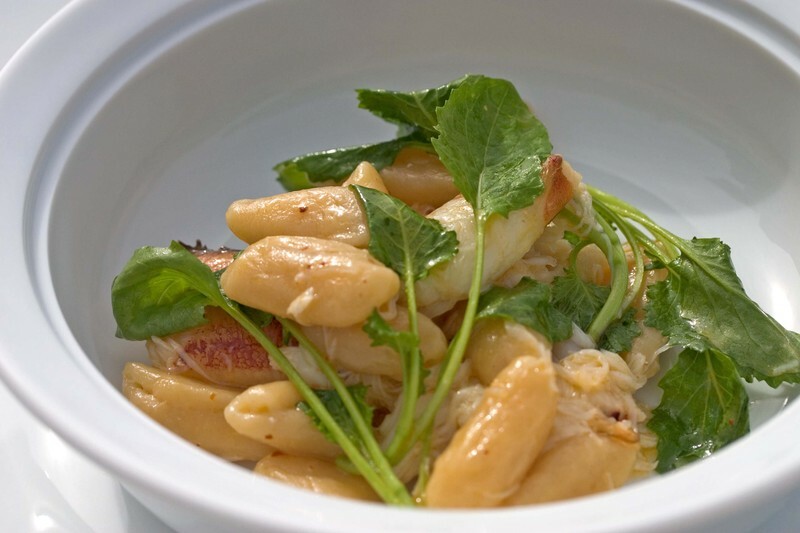 If you have made and eaten Aki's white miso cavatelli recipe you will know what I am talking about. 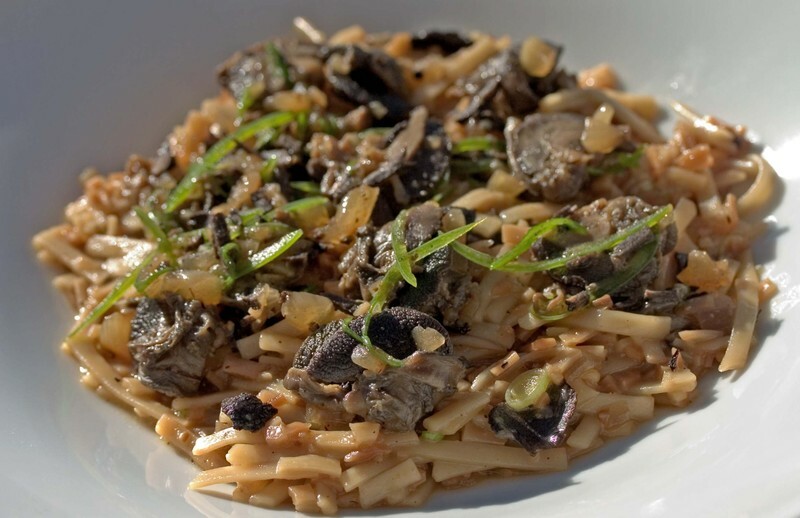 We finally pulled together the necessary ingredients to put miso cavatelli on the menu. The dish begins with thinly sliced garlic and Aleppo pepper bloomed in warm olive oil. We add the cooked cavatelli to the infused oil and make a quick pan sauce with the water clinging to the cavatelli and the olive oil. Since I really like butter and miso we added a small walnut of butter to the pan to enrich the sauce. At this point we folded in dungeness crab meat to warm through and then at the last moment some young broccoli rabe. The dish was done. What to do with small lobsters? Eat them of course. Most lobster lovers need to have at least a two pound lobster to make make them happy and more often than not only a three pounder will do. I, on the other hand like lobster, but am not one to perform surgery on the carapace looking for every last morsel of sweet decadent meat. Because of this fact, small lobsters, which have not developed pockets of meat to be discovered, are perfect for lazy preparations. And that is what we have done. Tonight we are serving olive butter poached lobster tail with its own crepe, smoked tomato pudding and cucumber-marjoram relish. Do you remember zucchini bread? Its dark, sweet, aromatic, studded with nuts and full of grated zucchini persona. The stuff is amazing, sliced and cooked in a toaster oven with a knob of butter melting into the pockets in the homemade loaf. That was the memory. Today we make a lighter version of that zucchini bread, more like a cake. We then ground the cake into crumbs and toasted them in butter. Those crumbs by themselves are a delight. I originally tried to be cute and use the crumbs as a coating for white asparagus. That dish went into the bin but I wanted to work with these decadent zucchini cake crumbs. This morning I returned to what I know. We made a nest of the zucchini cake crumbs in a dish and topped it with our smoked chocolate and coconut milk ice cream and a zucchini ribbon dusted with powdered coconut. Now that is what I am talking about. "I was pretty sure this was the wrong way to do it, but I did it anyhow." Unfortunately we hear this a lot. What I truly don't understand is why people think it's easier to do something the wrong way and then have to go back and re-do it again. Because that's what happens, every time. Here's a new's flash, if you think it's wrong, you're probably right. As Alex loves to say, "Common sense just ain't so common." Yesterday we got an amazing shipment of cheese in from Cowgirl Creamery. One of the first things that caught my eye was the clabbered cottage cheese. The cottage cheese curds are made from skim milk and then dressed with fresh clabbered cream. I really wanted to use it immediately, while it was tugging at my taste buds. Then I remembered the cavatelli. Alex had asked me to make a miso cavatelli dough, it was an idea that he had gotten from Wylie while he was in New York. To my mind, the cottage cheese would be the perfect foil for the salty richness of the miso and I proceeded accordingly. As Alex mentioned yesterday, the cavatelli maker broke down almost immediately. We were forced to revisit days of old before we owned the machine. Because of this we can share some photos of the traditional manual method for everyone who doesn't own a special machine for making their cavatelli. I actually prefer the handmade specimen, it has more character and there's no question that it came from our kitchen. The cavatelli can be cooked immediately or frozen and cooked directly from the freezer. We plan to serve it with baby broccoli rabe and dungeness crab meat. If you decide to try the recipe, we'd love to hear about your creations as well. Combine in a food processor and pulse to blend. Once a rough dough has formed, turn it out onto the counter and knead by hand to form a cohesive mass. Or combine all ingredients in a large mixing bowl and knead by hand. Once the dough comes together, turn it out onto the counter to finish kneading. The cottage cheese curds will cause the dough to look slightly scrambled and this dough is slightly rougher and drier than traditional pasta dough. Wrap with plastic and let rest for an hour at room temperature before forming cavatelli. We rolled the dough out to a thickness of about 1/4". The we cut them into strips approximately 1/2" thick. Cover the extra strips with a damp towel so the dough doesn't dry out while you are making the cavatelli. You can use a butter knife or a bench scraper to make the cavatelli. Have a floured sheet pan at the ready on which to rest the finished pasta. butter knife or bench scraper. rapidly. Cook immediately in boiling salted water or freeze on the sheet tray. The frozen pasta can then be stored in plastic bags and cooked directly from the freezer. fToday has been an up and down day. It began with the preparation of Sugar & Spice. (more to come on that subject in a few days.) Aki made an incredible white miso and clabbard cottage cheese cavetelli dough for me. 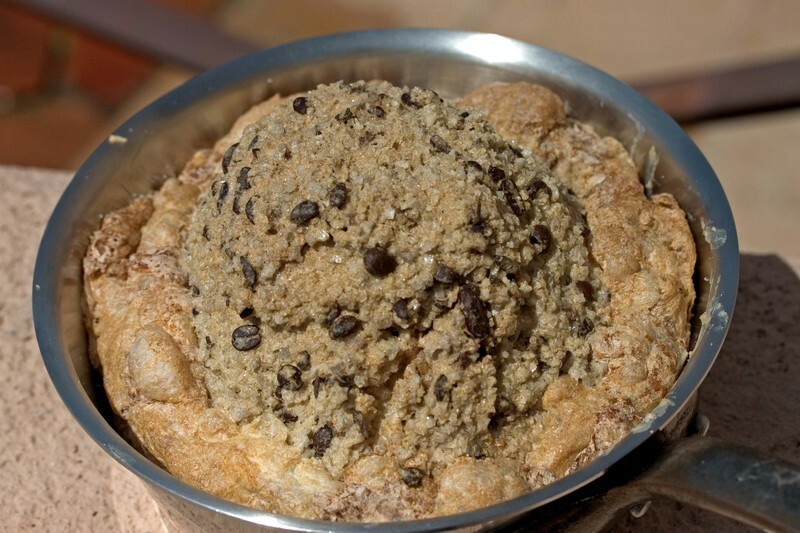 The dough is a flavor bomb with great texture, something I wish I could have put together. Sometimes when your mind wanders down alleys you forget to open the doors. Anyway, I began rolling out the dough and my cavetelli maker broke. And guess what? No one has any. They are back ordered until who knows when meets not going to arrive. @$%^!!! So now I have to figure out a way to hand roll cavetelli and give the dough a fair show at the derby. I decided to mellow my mind by smoking something--preserved tomatoes. My goal was to make a firm tomato conserve which could be used for multiple applications. I will see how it turned out tomorrow. I returned to the stove top with the ambition of making zucchini crisps. I succeeded and was eager to integrate the crisp into a dish. Well, I had braised white asparagus on hand and a zucchini cake as well. I figured lets start combining ingredients. Sometimes my method works, sometimes I need to get a bigger bin. 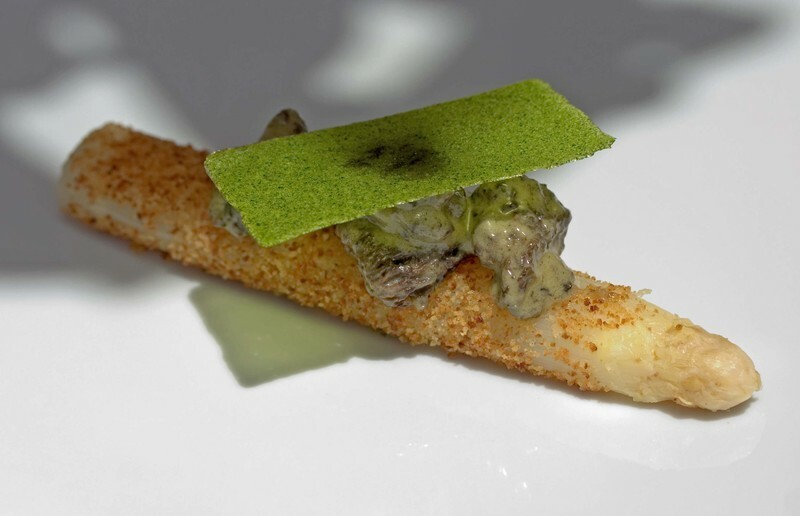 The dish was warmed white asparagus which had a unique almost molten interior crusted in zucchini cake crumbs topped with creamed morels and a zucchini crisp. The dish tastes good. The dish looks good. But, something is off. Aki mentioned some petite herbs would punctuate the dish. I was not so sure. Anyway, the elements were all tasty, kind of like yesterdays asparagus dish, yet not harmonious. And thus I need a bigger bin. Cooking for myself is not a skill that comes easily. In my professional life I cook for others and take great joy in preparing delicious, well thought out meals. At home I am happy to prepare meals to be shared with Alex or other friends and family. But on the rare occasions when I’m on my own, cooking becomes an awesome task. Somehow the amount of effort that goes into preparing anything other than the simplest of dishes seems like entirely too much trouble. Even when I put some effort into creating a more elaborate meal for myself it almost always falls flat. I’m sure there are some deep-seated psychological reasons for this tendency to ruin my own supper, but the end result is that pasta with butter and cheese is the standard meal when I eat on my own. Last week while Alex was away we received a gorgeous shipment of fish. I wrote about the way that I took great pleasure in cleaning the specimens and smoking some for future use. I kept aside some impeccably fresh calamari for myself. My thought was to grill it since we had some amazing grilled seafood at Demetris in Astoria while back east. I had a craving for curry so I briefly marinated the bodies in curry powder and olive oil. There was some rhubarb in the walk-in that needed some love and I thought its bright flavors and crunchy acidity would make a nice contrast to the tender sweetness of the calamari. I cut it into a delicate rectangles and let it macerate with a pinch of sugar and salt. I had some green onions as well so they were finely sliced and added to the rhubarb for a bit of astringency and earthiness. 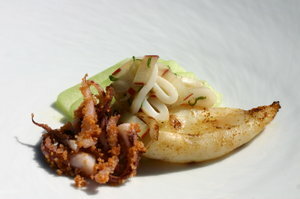 The tentacles have always fascinated me because they awaken such visceral reactions when they appear on a plate. People either love them or hate them and the members of the latter camp tend to be quite vocal in their prejudice. I believe that it is the look of the tentacles more than the flavor that provokes such virulent antipathy. 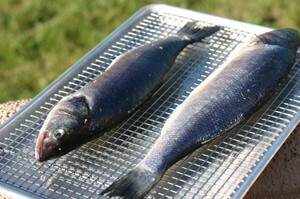 When cooked whole they are awkward to eat because of their size and shape. With that in mind I separated the tentacles into individual members so that they would look less like distorted sea spiders. Then I briefly sautéed them over extremely high heat and then rolled them in chopped, toasted almonds to add some complexity and crunch. The last element on the plate was some compressed melon. I thought that its sweet juicy flavors would be a nice addition to the dish. Besides, Alex had asked me to use it up while he was gone and eating it with a squeeze of lime and a sprinkle of salt seemed like cheating somehow. I grilled the bodies and sliced one into rings, which I dressed with the rhubarb and green onions. I squeezed a judicious amount of fresh lemon juice over the remaining body and paired it with the marinated calamari, the warm almond dusted tentacles and slices of melon. The dish had all of the flavors and all of the elements but still it somehow fell flat. Each component was good on its own and perhaps I would have enjoyed it more if I had someone to share it with. There would have been some distraction for my inner critic. Although some of the elements may reappear, such as the tentacles which were succulent and nutty, the dish as whole was definitely one destined for the bin. The last week or so has been hectic and slow at the same time. Slow because we have only had a couple of people staying with us. It’s hectic because Memorial Day weekend is unexpectedly kicking off our season. Last year Memorial Day was a non-event and June was slow. 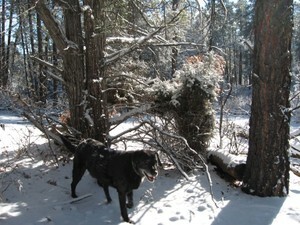 A few weeks ago this still appeared to be the case and we were conservatively gearing up for the season. Suddenly June became much busier than it was last year and people were calling about Memorial Day weekend. In short order we were scrambling to find enough staff to cover the small influx of reservations. Mind you, we only have five staff members on at the moment, the two of us, Michael the General Manager, Carolyn our Reservations Coordinator and Perla our one lonely housekeeper. So, even a few rooms can be challenging at times like these. We are very fortunate that several members of our part time wait staff will be returning for the season. We are less fortunate in that many of them will be away during this critical time period because we did not expect to have this much business yet. Housekeepers and spa staff are another story and we are basically starting from the ground up this season. It’s a positive dilemma and we’re definitely not afraid to roll up our sleeves and dig in wherever necessary. Alex is good at airport runs and carrying bags and I’ve been known to make a bed or two. We’re very excited that reservations are starting to fill in. Now we just have to assemble the team to make it run smoothly. One of the pitfalls of seasonal employment is when people who were not necessarily our finest employees wish to return. We may have liked them personally but had not been overly impressed with their job performance. It’s especially tough when they come knocking at a moment when you are somewhat urgently in need of bodies. It takes a great deal of faith to stick to your guns and gently turn them away. In my mind I wonder if anyone else will apply and if it isn’t better to bring back someone who is familiar with the system and needs less training. The sad truth is that if they didn’t perform well in the past and you bring them back, they will probably do a worse job the second time around because they think it's acceptable. Although others may not agree with me, I’d rather work a little bit harder now and wait for the right person to come along than set myself up for an uncomfortable situation in the very near future. Although the moment of rejection, no matter how nicely we phrase it, is not a pleasant one for any of us. One of the most important non-culinary lessons we’ve learned is that one negative staff member can have a viral effect on whole group. Although it may seem counter-intuitive to do the extra work ourselves, in the long run I know that patience and perseverance will pay off. Sometimes finding the right personality is more important than just finding the person in the right place at the right time. In the meantime I'm feeling the urge for sugar and chocolate. We bake chocolate chip cookies for turn down service and there's always fresh dough in my reach-in. A couple of chocolate chip cookies, still warm from the oven will revive me and give me the added energy to push through the rest of the afternoon. A brief tip on cookie making, this is one place where the butter you use really makes a difference. We use Strauss Organic Butter for these cookies and Guittard chocolate chips. The fewer ingredients in your recipe, the more important the quality becomes. Place flour, salt & soda in a bowl and whisk lightly to blend. Set aside. 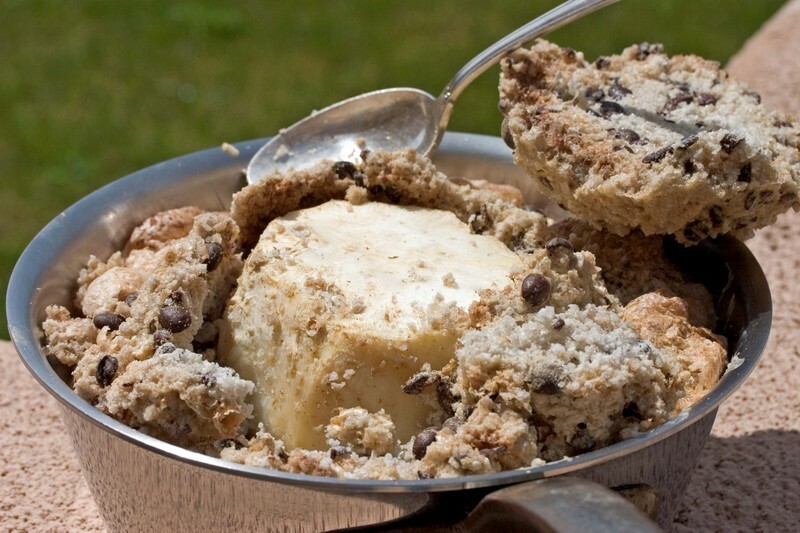 Cream butter in a mixer. Add sugar 1/2 a cup at a time and blend until light and fluffy. Add eggs one at a time making sure that the first egg is thoroughly absorbed before adding the second egg. Once the second egg has been fully incorporated stop the mixer and add all of the flour to the bowl. Mix on low until the dough just comes together. Add chips and fold into the dough by hand. Turn dough out onto plastic wrap, wrap it up and chill the dough in the refrigerator for at least one hour. Preheat oven to 375˚ F. Shape cookies and place on a sheet tray. Bake 5-7 minutes, rotating if necessary until golden brown. Fresh frog legs have been difficult to attain. Because of their scarcity I had put a dish on hold. However, my patience is still not great and I wanted to start serving fideos made with Japanese noodles. The original dish was to be a stew of frog legs with buckwheat fideos, dandelion greens and bagna cauda sauce. I adapted the dish to become a ragout of snails with preserved Perigord truffles, udon fideos made with bagna cauda broth and shaved scallions and jalapeno. 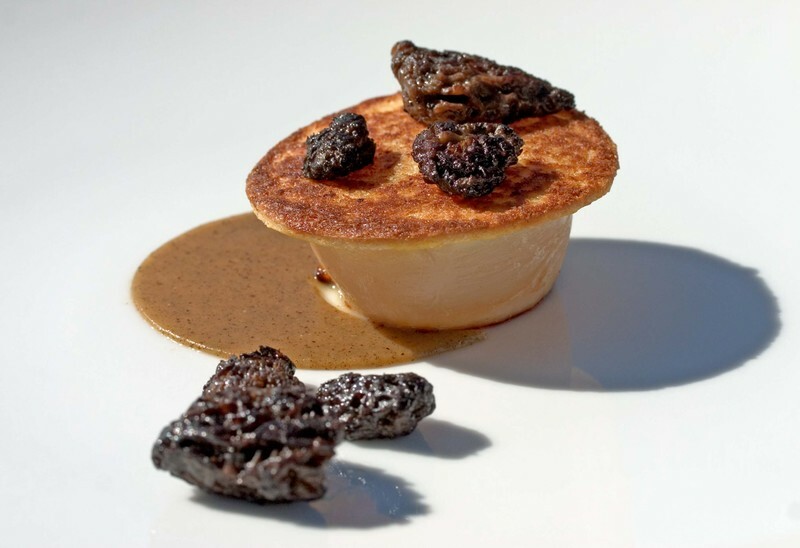 The dish is rich and decadent perfumed with the headiness of truffles and spiked with the shaved jalapenos. Oh, and fideos are traditionally a broken noodle cooked in a similar style to risotto with the addition of liquid in small amounts after the starch is first toasted in olive oil, butter or another fat. Our dish balanced with our charred onion vinaigrette and is finished with a knob of butter to add a final creamy richness to the dish. I wish I could say this technique or idea is ground breaking and world changing. It is not. 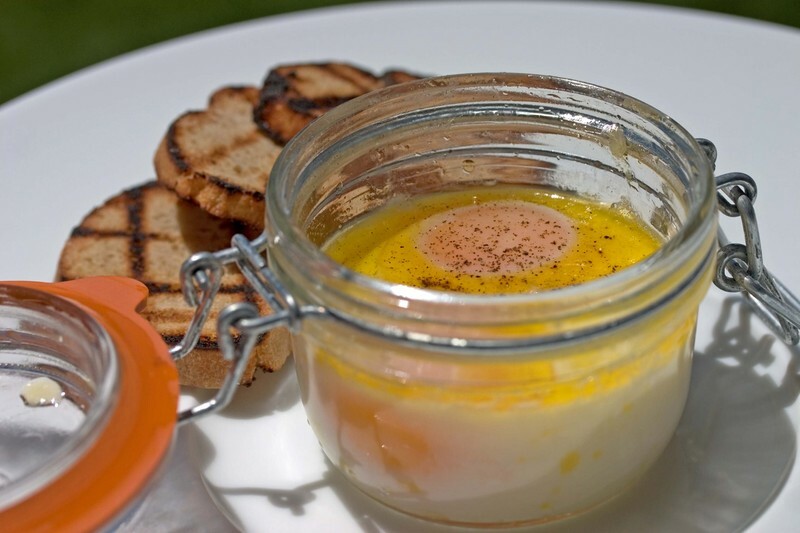 Rather, this is a great and simple way to prepare coddled eggs for one or one hundred guests, where the eggs are perfectly cooked, flavored and will stay warm while the guest eats them. In this simple preperation we cooked the eggs in a 63.8 degree C water bath for one hour and fifteen minutes. The eggs were seasoned with salt, truffle oil and a knob of butter. We served it simply with grilled toast though a warm mushroom and asparagus stew spooned over the eggs would be equally smashing. Aki made an incredible eggplant puree which combined a charred eggplant, anchovies, charred jalapeno and salt. The puree was then strained and the result is an intense puree of eggplant with flecks of char, a faint heat and a salinity from the anchovies. 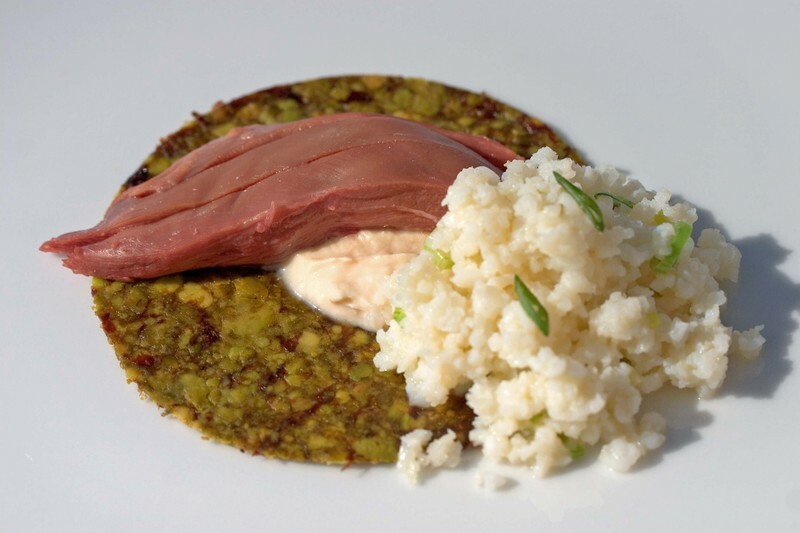 Yesterday we paired the puree with our chicken skin crusted tuna. 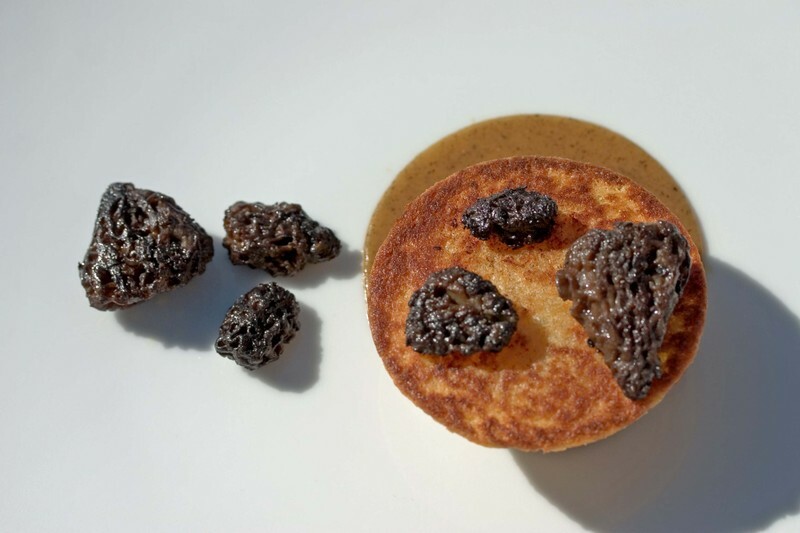 Today we worked on refining the presentation of the puree and used it to compliment a toast crusted scallop with morel mushrooms. What we figured out is that we can sandwich this puree, or any for that matter, between two acetate sheets and then freeze it. The frozen puree can then be cut with cutters dipped in hot water and the puree applied to a warm plate. The plate can then if necessary be placed in the oven to warm the thin layer of puree, though usually the warm plate will be enough to heat the sheet of puree. The dish is then finished with the toast crusted scallop and roasted morel mushrooms. I seem to be unable to leave well enough alone. Actually, I just have a chicken skin fetish and am always looking for means to integrate it into our cooking. Today we were able to adhere chicken skin to an ahi tuna loin. 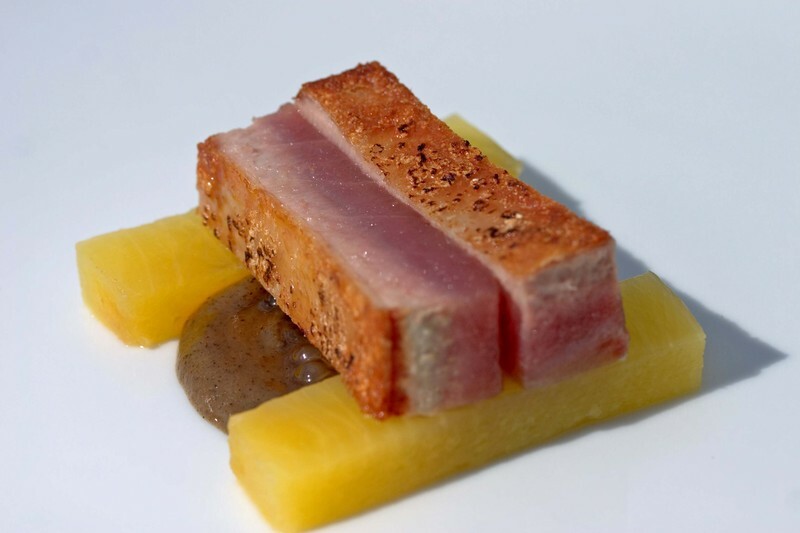 The cooked tuna presents three textures: crispy, meaty and silky. 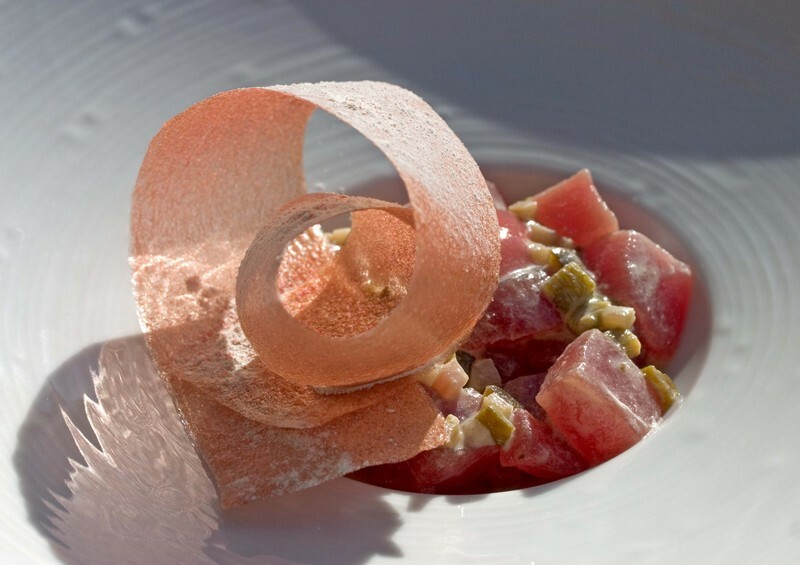 The skin provides the crunch and richness to the tuna. 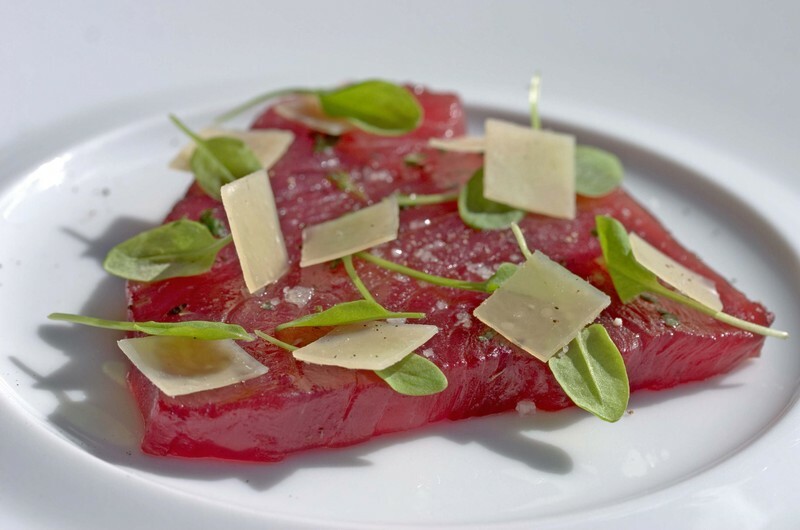 Below the skin is the meaty texture of cooked tuna which then gives way to the silken raw tuna beneath. We paired our chicken of the sea with a charred eggplant-jalapeno puree, olive brined pineapple and maple vinegar tapioca. We have been fine tuning a number of dishes, working through the kinks and trying to allow the flavors to pop on the palate. Sometimes, subtle speaks volumes. That thought became apparent in a dish featuring hamachi. 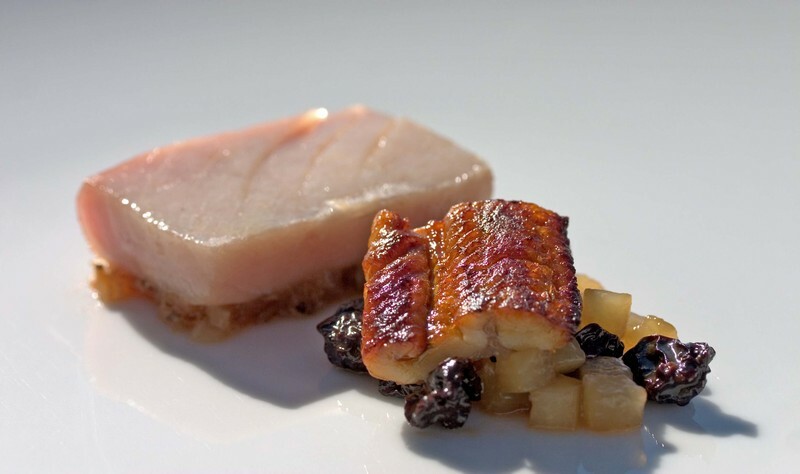 We paired the just warmed hamachi with its silky and buttery texture with a charred onion vinaigrette. The dish also contained some Japanese eel and a relish of cucumbers and tart cherries. 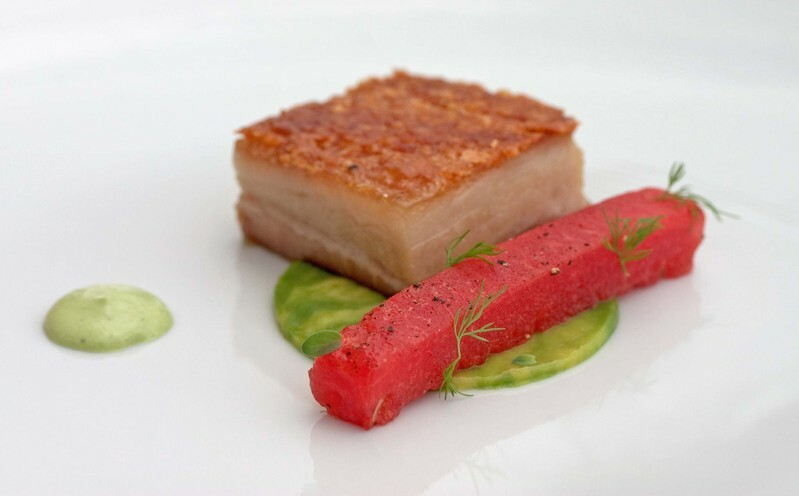 These components played texture and acidity off of one another, with the crunch and acidity coming from the the fruits and vegetables and the proteins providing a lasting impression of decadence on the palate. Gorgeous steaks are on the menu today. We’re cooking at home and so they will be served simply to accent the luscious beefy flavors of the meat. We have indulged in prime beef from Lobel's . 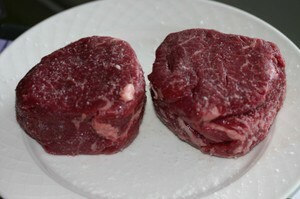 Today’s choice is a pair of twelve-ounce filet mignons to be seared and served with salad. The salad will probably be a mélange of chopped romaine lettuce leaves, sweet onions, avocado and tomatoes lightly dressed with lemon juice and the pan drippings. The steaks are dry aged prime beef, tender and juicy. 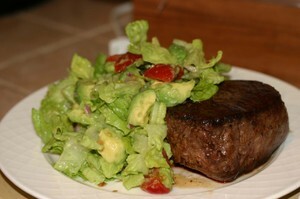 Filet mignon is a cut that has fallen out of favor although when you have high quality meat it can be revelatory. Although I love a rich, fatty rib eye or a gorgeously marbled and chewy sirloin, there is still something to be said for the much maligned tenderloin. It is a subtle cut of meat, one that you don’t have to wrestle with a steak knife, as it is one hundred percent edible on the plate. Its leaner qualities allow it’s elegant flavor to quietly shine and its softer texture allows the abundant juices to wash across my tongue in cascade of succulent flavors. When I was growing up filet mignon was still in vogue. Bacon wrapped, charred steaks dripping with melted butter were seen everywhere paired with hash browns, cottage fries, fried onions and creamed spinach. The tenderloin was very expensive and considered to be the crème de la crème of fancy dining and special occasions. Meals were begun with shrimp cocktail or chopped salads and finished off with cheesecake, fresh berries with whipped cream or impossibly tall chocolate layer cakes. The traditional steak houses still exist and these meals can be had for exorbitant price tags. 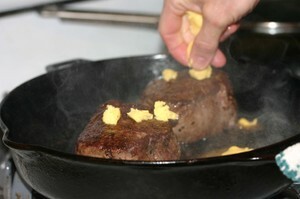 The filet is still on the menu, usually without the bacon, and offered in petite and king-sized portions. These days they are considered steaks for tourists and sissies. The true aficionados usually demur. They turn up their noses at filet mignon and talk of marbling and flavor. Everyone knows that real connoisseurs eat rib steaks because they taste so much better. Everyone knows this except me. I would argue that the rib eye possesses a different flavor as opposed to a better one. It has a stronger, beefier flavor, a chewier texture and part of the pleasure is ferreting out the most succulent morsels from their webbing of sinew and fat. It is a very masculine cut of meat and it too has its place in our culinary lexicon. In this particular shipment we also received a three-pound boneless rib roast made up of natural prime beef, which I am looking forward to cooking and eating with anticipatory glee. I love knowing that it’s tucked away, waiting in the wings for its moment in the spotlight. But today, today is about the filet. It is an equal performer with an entirely different routine and this particular relaxed afternoon, dedicated to good food and good company, it has the starring role. Somehow I don’t think we’ll be disappointed in it’s performance. Just for the record, at home we temper our steaks for about an hour before we cook them. We season them liberally with sea salt when we pull them from the refrigerator. We cook them in a smoking hot black iron skillet sprinkled with a fine layer of salt. We do not add any additional fat to the pan until the very end of the cooking process when both sides of the meat have formed a thick crust. At that point we add a generous spoonful of cold butter and baste the meat until the butter turns brown. At that point we remove the steaks to a warm plate and let them rest for at least five minutes before serving. If we’re feeling decadent, we rub them with a bit more butter while they rest and then pour the juices over the greens we are serving alongside the steak. 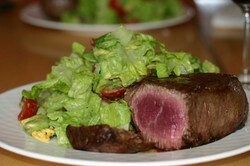 We enjoy the combination of a cold crisp salad with the full flavored juiciness of prime meat. It’s taken us years to eschew the traditional creamed spinach and potatoes but we believe that you need something that revives the palate alongside any truly decadent main attraction. 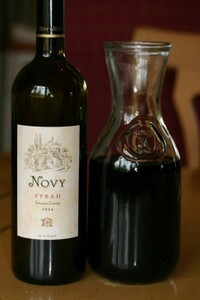 We drank a 2004 Novy Syrah from Sonoma. The wine was brambly, spicy, and peppery, with hints of ripe blackberries and suede. I know suede sounds strange but that really is what the wine tastes like. It is high in alcohol and slightly sharp although I’m sure that it will mellow with age. The multi-layered edginess of the wine actually paired quite well with the sensuous nature of the meal. It’s not something that I would drink on its own, but it was a perfect foil to the richness of the meat and the buttery smoothness of the avocado. We had the odd perfectly ripe avocado that makes you realize why these fruits are so special. It was rich and velvety, still slightly chilled and just yielding to the tooth. I love to dice them into salads to add a luxurious texture without adding any dairy or fat to the dressing. The generous portions of salad were a nice contrast to the beef. Alex benefited from my smaller stomach and finished the last third of my steak. We agreed that only thing that could have made the meal better would have been the sight, smell and sound of the ocean in the background. We’re just nitpicking though because the mountain views are no slouch. Frankly the meal was spectacular. When we cook extravagant steaks at home it always makes us wonder why people go out to steak houses. You can get high quality meat for less than you would pay in a restaurant. Ditto for the wine. Last but not least, you don’t have to drive home afterwards. The only things you give up are the luxury of being waited on and not having to do dishes. Really if it’s that important to you, you can bring in a server and still save money. On the other hand, if everyone cooked at home we’d have no business to support us. Occasionally though, it’s a wonderful treat to buy the finest of ingredients and enjoy them at home. We recommend the experience to everyone, as long as they don’t do it all of the time. Our ramp kimchee has been marinating for several weeks now and its flavor is truly remarkable. The intense allium flavor of the leaves is balanced by spice, acidity and the rich flavors of fish sauce and dried shrimp paste. We prepared the kimchee with whole ramp leaves so that we would have a bit more flexibility in its uses. 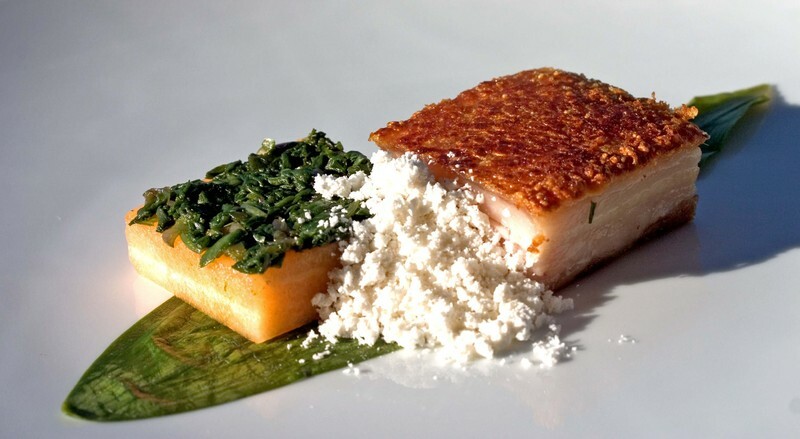 Today we used the kimchee to balance the richness of fresh pork belly paired with cantaloupe confit and powdered bacon fat. My copy of Vegetables By 40 Great French Chefs arrived while I was traveling and only yesterday did I get a chance to open it up. The book is about vegetables. It is quite interesting to see the variety of approaches chefs take to vegetables, some making stars of the ingredients others using them as a mere component of a dish. I have yet to sit down and read the book, but several dishes already piqued my interest. 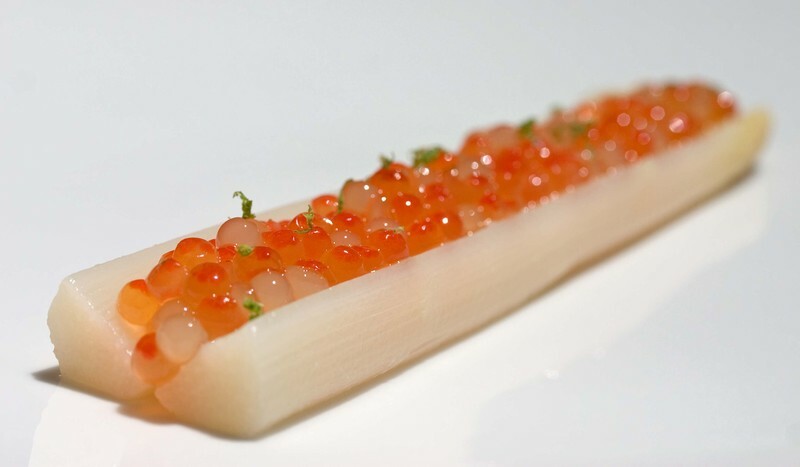 The first was by Pascal Barbot of L'Astrance, a dish of young carrots with a carrot cake sauce. 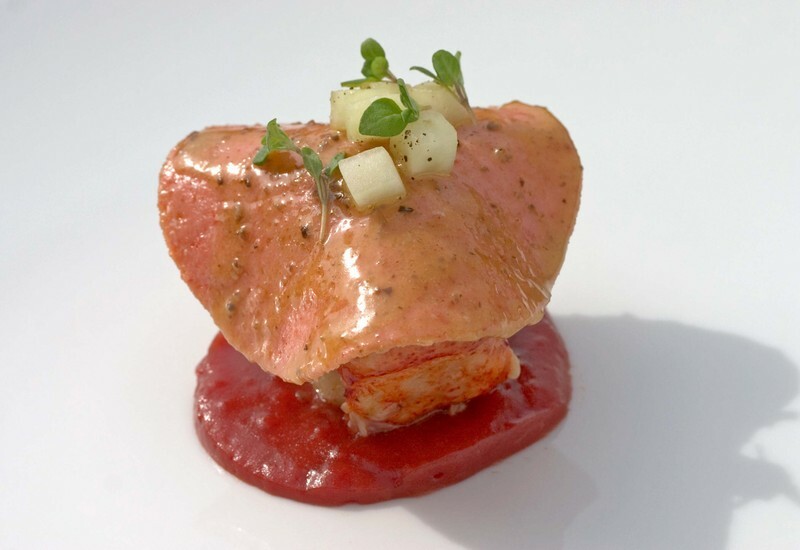 The other dish which was simple and clever was by Alain Passard chef at restaurant Arpege. His dish was a celery root souffle baked in a whole celery root. Funnily enough, Barbot worked with Passard before making his own destiny several years ago at L'Astrance. Both of these dishes sparked my idea. Today we made a salt crust with vanilla salt, cocoa nibs and coffee beans to encrust celery root. The root is whole roasted and is perfumed and flavored with the aromatic salt crust. Once the celery root is cooked, the crust is cracked, the root is removed and portioned to be the star component of a warm salad. 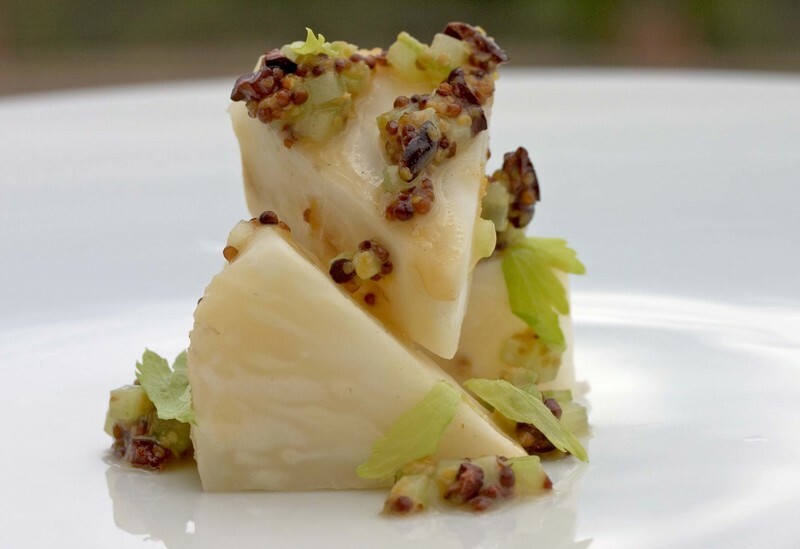 The warm celery root is dressed with raw celery, kaffir lime honey mustard, cocoa nibs and torn celery leaves. My only contention with the dish is in the roasting of the root itself. Next time I will use the heat proof Fata paper to wrap the salt encrusted celery root to make a giant softball of aromatic salt which can then be cracked open tableside for a fun presentation and a means to share the intense aroma of roasted celery root and the perfumes of coffee, cocoa and vanilla. Next time it will be better. What to do with an excess of Guinness? I realize many believe there is no such thing as an excess of Guinness just a lack of stomach space. Truthfully, we have been sitting on a number of cases of Guinness for several years now and we did not feel comfortable selling it. Sure I could have taken the best of treasure baths or bobbed for apples in the windfall of undrunk stout, but my need to create or at least not waste led me right to vinegar production. Today I began opening and subsequently wearing a vast amount of bottled Guinness. Once the beer was open and I was cleaned up I added our spruce infused wine vinegar to the barrels of beer, covered them with cheese cloth and began to let the natural vinegar run its course on the rich, creamy sweet and sour brew of aged Guinness. I prepared three large barrels of vinegar which will take several months to mature and one smaller barrel which I hope is ready to use in the next month. Now I shall begin searching for uses for this intoxicating condiment. It's Monday night and I'm picking Alex up at the airport in Durango at 11:32pm. Let's hope his flight doesn't get delayed. Since I'm on my own for this last evening, I went with one of my old (pre-marriage) standbys for dinner, macaroni tossed with butter and cheese (Gruyere tonight) broiled until crispy and brown. Just to make the entire experience super-healthy, I was eating my pasta in front of the television. Flipping channels I discovered Jamie's School Lunch Project on TLC. I stopped out of curiosity and got sucked right into the show. The premise is a good one from what I've seen, although slightly far-fetched. It consists of Jamie Oliver setting out apparently single-handedly to revamp the school lunch program in London. His goal is to create a system where the children can enjoy healthy and delicious food in the lunchroom. It's a wonderful idea. The partial episode that I caught consisted of Jamie's boot camp for school lunch ladies and his attempt to teach them all how to cook his new style of food for the cafeterias. They weren't exactly embracing the new regime but there didn't seem to be any outright mutiny either. It's not easy to change the way that people cook, especially seasoned professionals who are set in their ways. I'll be curious to see how successful his project turns out to be. It would be wonderful if all of his work paid off for the children. Whatever anyone thinks of Jamie Oliver as a chef, there's no denying his philosophy of giving back to the community. First there was Fifteen and now the school lunch project. It's a nice reminder that we can take what we do inside our kitchens and use it to make someone else's day a little bit brighter. With all of the obsessing that I've been doing about the future, it was a nice reality check. There is more to life than money and business. There's a whole world out there that needs nourishment and so few of us who are willing to take action on even a small scale. Thank goodness each new day is an opportunity to do better. I was certainly influenced by the beet ribbons of team Adria. I was re-introduced to these ribbons at Gilt and again in a recent cookbook, Sergio from the the restaurant Oud Sluis . Anyway the ribbons have an interesting aesthetic, one which I wanted to mirror, just why did I always see it in beet. I opted to take the concept of the crispy delicate ribbon and introduce it to rhubarb. I also did not want to serve the ribbon on its own. Rather I felt the ribbon with its texture and flavor profile would provide an interesting counterpoint to a number of ingredients. 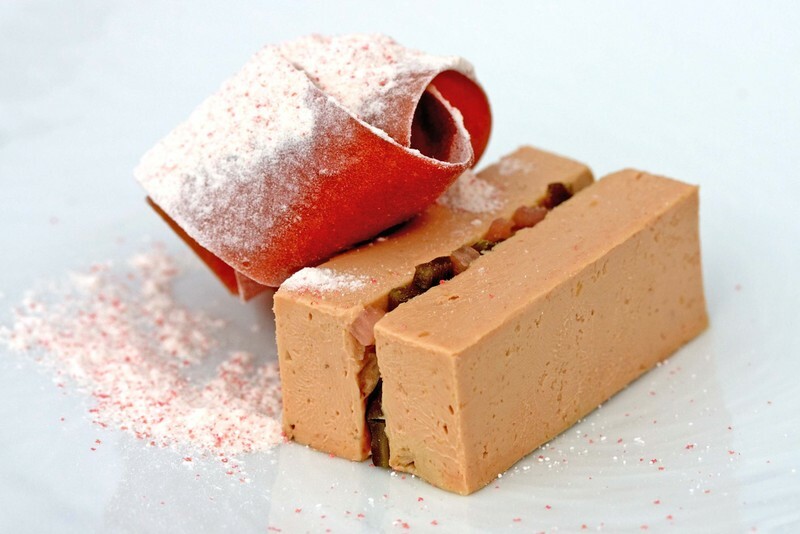 Most recently we paired a rhubarb ribbon dusted with powdered rhubarb yogurt, foie gras terrine and a rhubarb-poblano relish. I originally identified these fish as Tasmanian Sea trout in an earlier post and subsequently discovered that I was wrong. The Tasmanian Sea Trout were much larger than the Loup de Mer. So, the picture you see is of impeccably fresh fish that has been cured overnight in a mixture of sea salt, white sugar and Sichuan peppercorns, which were toasted and then ground with the former two ingredients. After curing, the fish were then rinsed and allowed to dry on a rack in walk-in to form a pellicle (or protective skin) before being smoked. The pellicle will absorb the smoke's flavor while at the same time protect the fish from moisture loss during the smoking process. Once the pellicle was formed I hot smoked the fish with apple wood at 200˚F for 35-45 minutes (one fish was significantly larger than the other), until they were fully cooked. 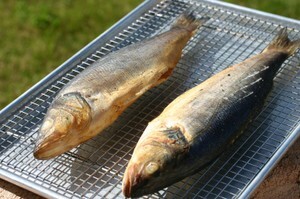 I have lot of ideas for using the smoked fish. It has been very warm this week. So my mind wanders to seemingly simple dishes like marinated smoked loup de mer, tossed gently with ginger juice, white soy sauce and finely sliced green onions, served alongside chilled soba noodles with a dashi dipping sauce and shredded nori. I probably won’t go to that much trouble to cook for myself. On the other hand, the fish will keep and we’ve got guests arriving on Thursday. Although I’m sure I’ll have at least a dozen different ideas for the using the fish by then. Mustard has character. It is not the universal condiment like ketchup. Well, actually if you order a hot dog with everything you get mustard not ketchup. And yet ketchup seems to have a universal appeal while mustard warrants its own distinctions. I was recently drawn to mustard. I have played with a variety of ketchups from smoked rhubarb to Meyer lemon and been inspired by the variables available in that guise. Well, I turned my attention to mustard. I began working with whole grain and Dijon mustards. The first bastardization I worked with was whole grain honey mustard perfumed with kaffir lime leaves. The honey picked up the floral notes of the lime leaves and transferred them to the mustard. The second mustard of note is passionfuit-vanilla. I blended a passionfruit caramel with a spicy Dijon mustard and Bourbon vanilla. The sweet tang of the passionfruit cuts through the spicy mustard and the rich vanilla notes blended in the mustard. This is a fun mustard one that would be great with crustaceans or young vegetables. Finally we made chocolate mustard. Yes, it is that simple. We melted a 70% chocolate with Dijon mustard. The flavors simply balance each other: sweet, spicy, salty, tangy, fermented, the list goes on. The chocolate mustard is really exciting. It will be great in sauces and marinades as well as lightened into delicate foams for slow cooked fish. I suppose if I were really clever I would have smoked the chocolate for the mustard. That is why there tomorrow. "I don't eat fancy food." It's absolutely amazing how often those words are uttered by people making reservations at Keyah Grande. There are several reasons for this, the most prominent one being that about half of our guests are leisure travelers and half of them are hunters. Hunters do not like the idea of "fancy food". About a quarter of the leisure travelers, usually the older ones feel the same way. Although people are compelled to make this statement when they book a room, very few of them are able to explain what fancy food is exactly. They just know that they don't eat it. The rest of the guests are open to anything, apparently. That is until they arrive and another 25% of them have strange allergies and aversions that only surface when the food arrives at the table. I much prefer the ones that tell me what they don't eat to the ones that wait until the food is in front of them to explain that they just don't eat fish or chocolate or onions or what have you. But let me clue you in on a little secret. The majority of the people who claimed they don't eat fancy food ate ours with great enjoyment. We didn't change much about what we do, perhaps increased a portion size where appropriate. What we did change was the way we described the food. That one small adjustment in perception made all the difference. Because everyone enjoys good food regardless of how fancy it may seem on the surface. Today on Slashfood there was a post about and Italian Michelin starred chef who just came out with a cookbook for dogs. This brought to mind Amazing Gracie, one of my favorite books from last year. It's the story of how the adoption of a deaf, albino Great Dane puppy led to the establishment of Three Dog Bakery in Kansas. I've never made it to one of their outposts but the bakery is now a national chain, feeding happy dogs around the country. It's quite a story. Reading it will make you laugh and cry and want to run out and adopt an unwanted puppy of your very own. When I finished readiing Amazing Gracie, I sent it out to friends and picked up their two cookbooks Short Tales and Treats from the Three Dog Bakery and The Three Dog Bakery Cookbook . I decided that cooking for my dogs was a great way to show them how much I loved them. 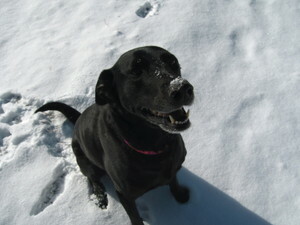 Frankly, Patty tends to turn her nose at a lot of things, but homemade dog treats were an instant hit. So of course we evolved a few recipes of our own. We use organic ingredients whenever possible when cooking for the beasties. As Inky gets older (he's been twelve for several years now), I'm more careful with what he eats than with what I feed myself. Dog biscuits are incredibly easy, especially if you use a food processor, so you really have no excuse not to indulge your canine companions. 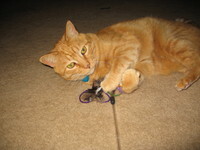 As for you cat lovers out there, don't worry, Lucky is by no means neglected. But, cat treats are a recipe for another day. Combine all ingredients in the bowl of a food processor. Pulse to form a crumbly dough. Turn the dough out onto the counter and knead a few times to form a cohesive mass. Roll the dough out into a rectangle approximately 1/2" thick. Cut into strips 1"X3" or into whatever shapes you choose. Bake on a sheet pan at 350-degree F for 30-35 minutes until golden brown. Let cool completely before serving. We have begun a new series of posts which will be filed under the category "Just Before the Bin." What are we doing? Well, we are sharing our greatest failures as well. Sometimes you need to look, taste, feel and live a dish or an element of such to see that it just does not work, or perhaps it sparks a new train of thought. And my choice this week is a Greek Salad dessert. WTF was I thinking? Actually, the elements of the dish are quite useful on their own but I certainly do not need to combine them. The dish is over complicated and over the edge. 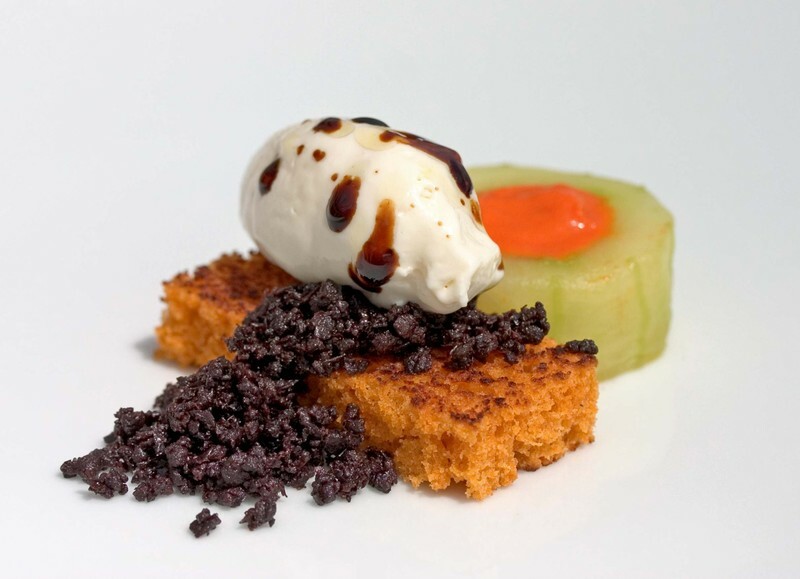 The elements are: minted cucumber confit, piquillo pepper pudding, feta ice cream, tomato cake, ground olives, aged balsamic vinegar and olive oil. I guess I missed the actual lettuce component. And how was the dish? Interesting. Yes, I enjoyed the tastes but in the end I would not want to eat it again and again. Thus, it--the dish-- goes into the bin. *All ingredients should be at room temperature. Cream butter and sugar with salt, pepper, baking powder and baking soda until light and fluffy. Beat in eggs one at a time until thoroughly incorporated. Mix together V-8 and tomato paste. Add flour and V-8 alternately to the butter mixture, beginning and ending with flour. Spread evenly in two 9-inch cake pans. Bake at 350-degrees F. for 20-25 minutes until the center springs back when gently pressed with fingertips. Would you like some coffee, an espresso a cappuccino? The question is always asked at the end of the meal. More often than not the coffee service acts as a disruption to the flow of the meal. So, we decided to see if we could just integrate the inevitable. I am fond of biscotti and espresso. The two balance each other, the crisp cookie absorbing the intense coffee extraction. And then with the introduction of espresso comes the idea of Sambuca. NO, not always, but many times it is in the back of the mind. So, we brought the tastes, textures and ideas of the end of the meal coffee and put it into a dish. 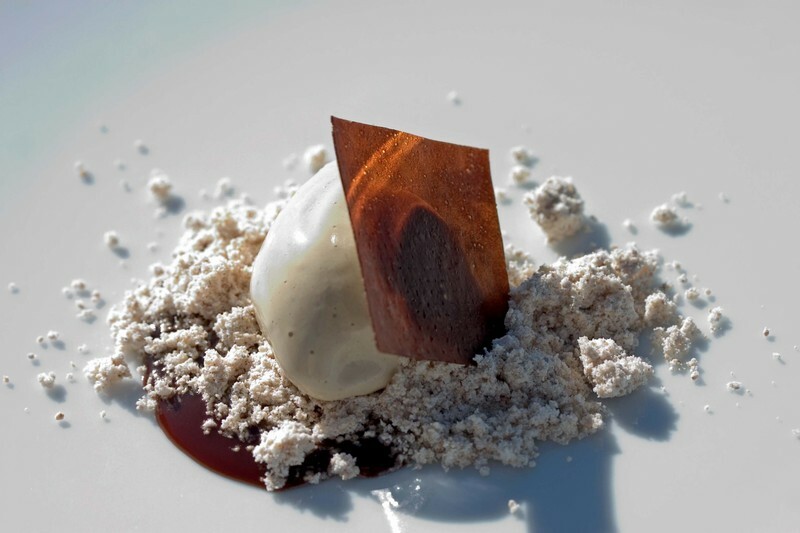 Here we have espresso ice cream with powdered salted almond butter and licorice puree and crisp. In the process of cooking and assembling ingredients you must continue to ask a very important question. "Is what I am making better than the original?" Sure, you can say that what is being made is original and try and dodge the question. Do not bother or you will begin to waste your time. 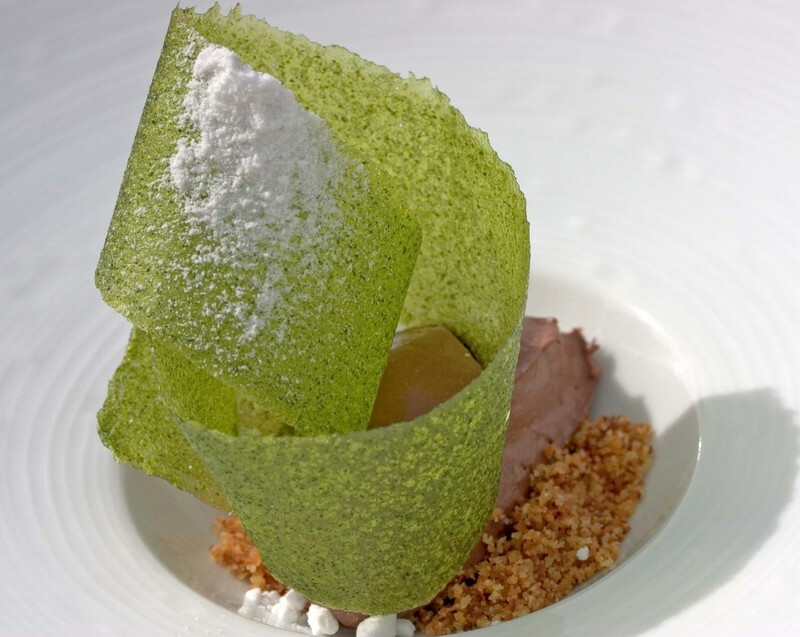 In some cases, the form of an ingredient becomes integral in its taste and aesthetic. Still, the question must be asked. Similarly, the form or means of delivering an ingredient can be the means for making an ingredient or dish better. We have only been back in our kitchen for several weeks and I have been continuously challenged by this question. In fact, it can become a stumbling block and that is not the point of bringing it to the foreground. Rather, it essential in making better food. It has become apparent that I have a gnocchi fetish. One reason for my intrigue is its small size, delicate texture and a means for flavor delivery. 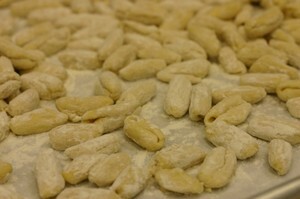 With those three basic guiding points I have been challenged to work with gnocchi in a variety of flavors. Yesterday we made avocado gnocchi. While preparing the base, I had that daunting question resounding through my thoughts. "Is it better than the original." Well, what original am I considering? With regards to gnocchi, I am working on a full flavored delicate dumpling which captures the essence of avocado in a miniature form. In the preparation of the avocado, I am able to present bite sized fully seasoned pieces of an ingredient which will not break down in a ragout. As I worked with the ingredients I worked through a trial dish featuring the avocado gnocchi. 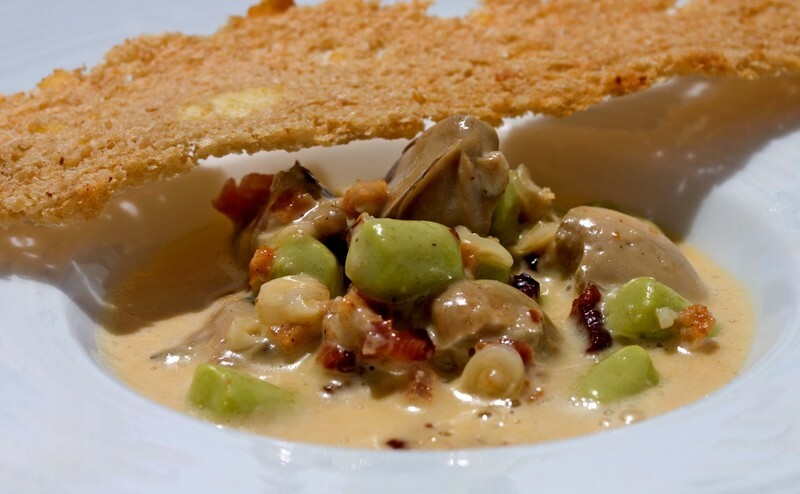 It is a simple oyster stew with ramps, bacon, the gnocchi and a smoked potato bread crisp. I have wanted to enjoy licorice. No, not the red stuff long or short, eaten on the go are gnawed on at the movie theater. I wanted to like black licorice. It is exotic, eaten by those who are mysterious or know something different. 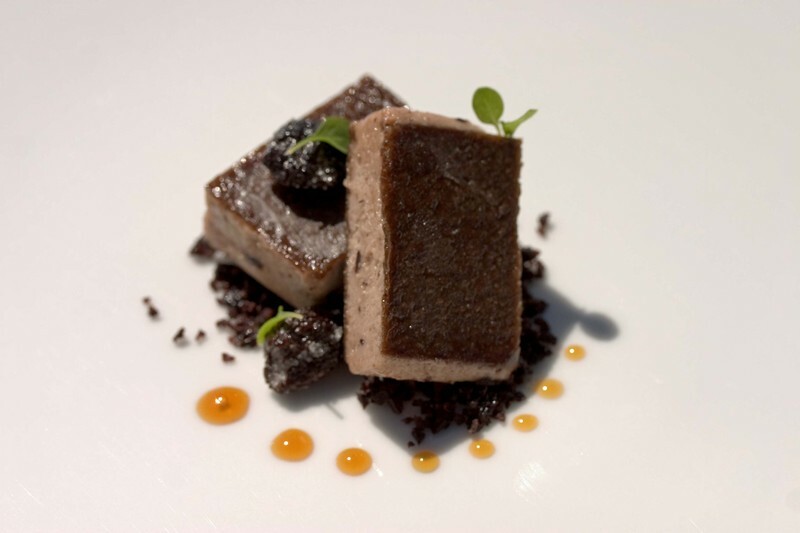 Chefs have cooked with licorice for a number of years, using it with sweetbreads and salmon and many dishes in between. And I have balked at the notion of integrating this mysterious yet common place ingredient into our cooking. I think part of my own hesitation is that I have not truly liked black licorice in the past. Its flavor is assertive and bracing and the texture keeps it on the palate far to long. So, I began having licorice thoughts. I wanted a simple sauce that captured the bracing nature of licorice, that did not hide the fact that it is intense, but also had balance and could share the spotlight on the palate. I did nothing special, in retrospect I think I borrowed from visual cues like black Sambuca and Jagermeister. I took ruby port, salt and black licorice and slowly melted them together to make a silky viscous sauce. When the licorice was melted, I strained the sauce and let it chill. The sauce is intense with the bracing notes of licorice though the fruity undertones of the port with a touch of spice balance the combined ingredients. Once the sauce was cold I noticed it had a pudding like consistency, something for the future. At this moment, I took some of the licorice sauce and dried it out to make a crisp to be a textural counterpoint to the smooth sauce. My first exploits with the crisp took place on the day I forgot to use my notebook. Anyway, the crisps worked out well and provided the opposition I was looking for in using the licorice sauce. 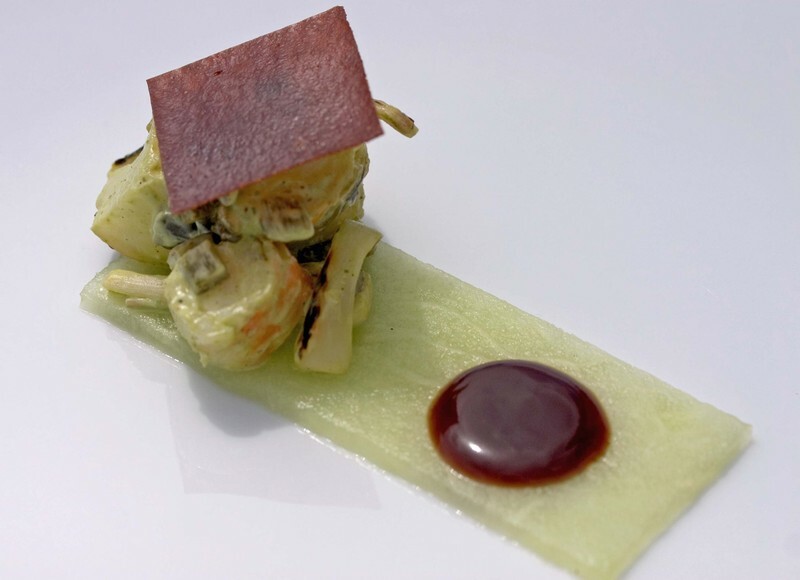 The dish which featured the licorice-port sauce included honeydew melon, Key West pink shrimp, poblano peppers, ramps and a touch of green goddess dressing. 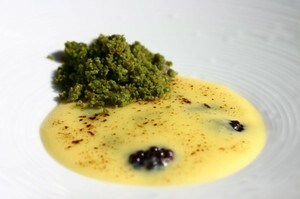 The herbal notes of the dressing were emphasized by the licorice sauce and crisp. It just took some time to work through a means of integrating and enjoying licorice. We have been working through a number of dishes for this spring and summer and are finally able to tie together our notebook scribblings to finalized products. Today we made our green goddess dressing to finalize our pork, avocado and watermelon dish. A week ago we worked with most of this dishes elements but exchanged the green goddess dressing for an espresso-ginger sauce. The dressing is made with a base of cream cheese blended with basil, oregano, tarragon and dill. The dressing is enriched with olive oil and crystal hot sauce. With regards to the finished dressing its herbal notes truly brighten our pork dish though Aki noted that this dressing would be amazing simply spread on a cracker topped with Blis smoked salmon caviar. That is another idea for another dish, one we shall be visiting soon. Every collaboration is an exercise in compromise. People often ask Alex and I how we are able to work together. The answer is simple, we have always worked together. It hasn’t always been a great collaboration. In fact when the chef we worked for way back when finally agreed to move me over to the line, I refused to train with Alex. It didn’t matter that I had been working my tail off and using every argument in the book to make the move from garde manger to grill, I wasn’t taking the new position if I had to train with Alex. I can feel him wincing as I write this. It’s not one of his favorite stories and I can’t blame him. I’m sure he can tell quite a few stories of his own. I probably would have been better off if I had trained with him. He was and still is one of the best cooks I’ve ever worked with. But I wasn’t going there. It’s not the first time in my life that I wrongfully assumed that I knew best. Regrettably it probably won't be the last. What I have learned to do is to be flexible. I can almost feel the waves of disbelief emanating from those who know me best. I’m the first to admit that I’m not always open-minded at first, especially when it comes to someone else’s ideas. I tend to view them with some skepticism, especially if they don’t jive with my point of view. 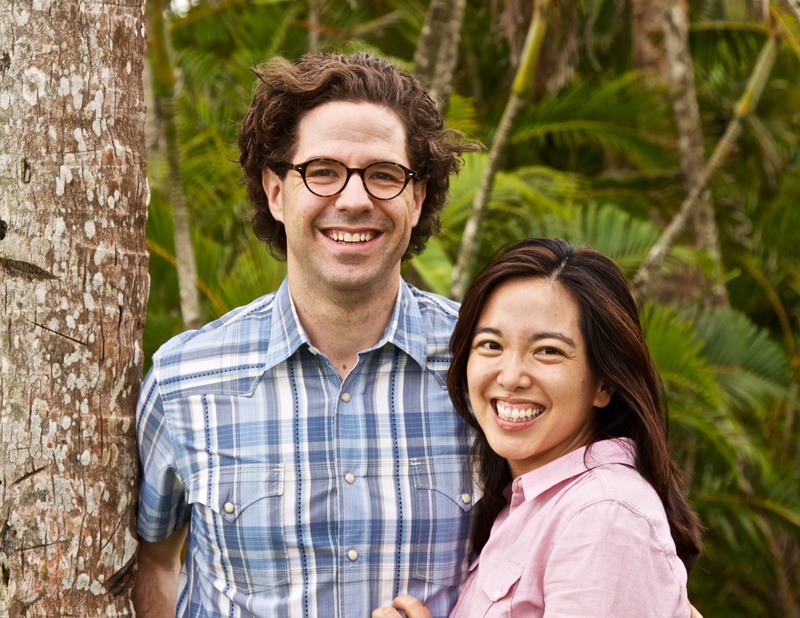 One of the many benefits of this long-term partnership is that I have learned how to step back and re-evaluate. Although at first blush I may reject a suggestion, it has become common practice for me to go back later and take a second look. I hate to miss out on things because of my own short sightedness. Since Alex and I tend to look at life from very different viewpoints, this means we both do a fair amount of backtracking over the course of a day or a dish. The end result tends to be an improvement on either of our individual ideas. I don’t know where I’m going with this because it’s not necessarily about food or cooking. Actually, I take it back because the ability to be open to different ideas makes our food better. 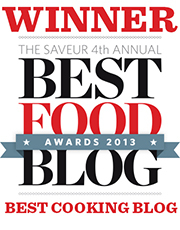 People who read this blog may describe some of our food as “out there” or “beyond the pale”. I don’t think that most of our diners experience that. Because our goal is to feed them, on whatever level they require nourishment. Sometimes that means challenging them with new ideas, sometimes that means comforting them with a sense of familiarity. It always means creating a sense of well being through food and service. The fact that we relate to people differently means we can empathize with different needs. What I find interesting is that sometimes the hardest people for us to empathize with is each other. It’s that constant struggle that prevents us from taking each other for granted (most of the time). On the other hand, the friction and re-evaluation has sparked some amazing ideas, ones neither of us would have come up with on our own. Sometimes we just need to remind ourselves of that.